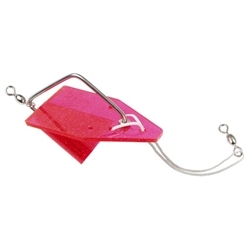 The Luhr Jensen Pink Lady is a Trolling Sinker with Slip-Trip Action with All Stainless Steel Hardware. The Pink Lady Automatically Sets & Dives with a Resettable trip mechanism in a Fish attracting color. 4-1/2"